← KNOWING SELF, THE UNKNOWN ITSELF. WHO, OR WHAT WE REALLY ARE? is an Atom, and the Atom a World. Tired of their age-old anarchy, the birds resolve to go in search of him. 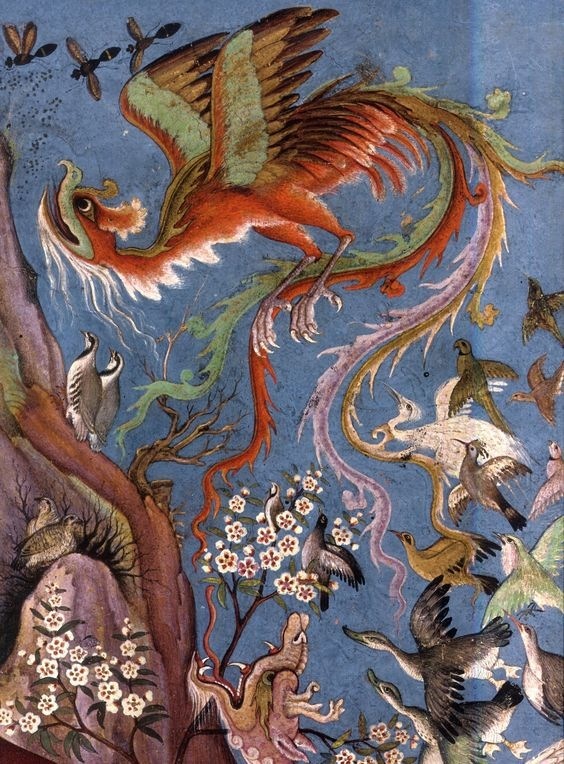 They know that their king’s name Simurgh, means thirty birds; they know his palace is located on the Qaf mountain, the circular mountain that surrounds the earth. Mount Qaf in Arabic tradition is a mysterious mountain renowned as the “farthest point of the earth” owing to its location at the far side of the ocean encircling the earth. It is also the only place in this world where the Roc will land. They embark upon the nearly infinite adventure. They pass through seven valleys or seas; the name of the penultimate is Vertigo; the last, Annihilation. Many pilgrims give up; others perish. Thirty, purified by their efforts, set foot on the mountain of the Simurgh. At last they gaze upon it: they perceive that they are the Simurgh and that the Simurgh is each one of them and all of them. 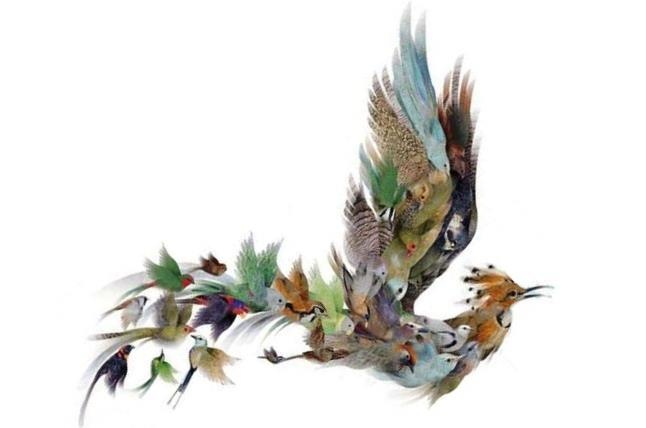 In the Simurgh are the thirty birds and in each bird is the Simurgh. The poem was written around 1200 by the Sufi poet Farid ud-Din Attar. 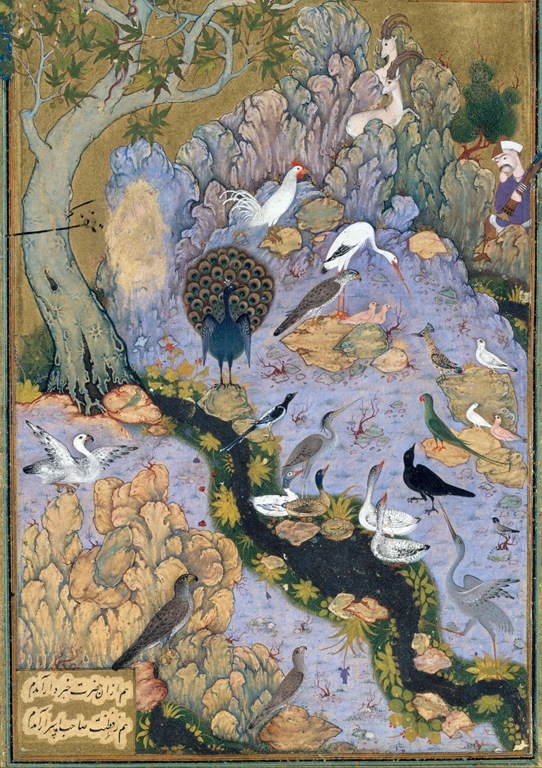 About thirty works by Attar survive, but his masterpiece is the mantiq at-Tayr (The Conference of the Birds). In the poem, the birds of the world gather to decide who is to be their sovereign, as they have none. 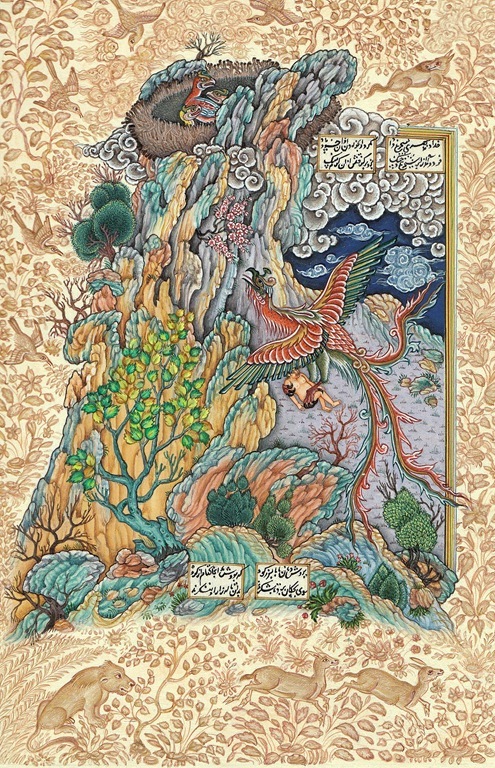 The hoopoe, the wisest of them all, suggests that they should find the legendary Simurgh. The hoopoe leads the birds, each of whom represents a human fault which prevents human kind from attaining enlightenment. are but the shadows cast by that unveiling. What shadow is ever separated from its maker? so get over surfaces and delve into mysteries. Now, this book was recommended to me by Adam, a friend of mine over 35 years ago, and had it in my hands many times at the bookstore, and read just snippets of it, I am fastidious, and particularly with books, and want the best translation, and the best format, and was not satisfied with the stuff available at the time, so, then just took it out of the library and read it. I just bought it a few days ago, compromising as usual, I may buy another one, by a different translator. Upon a giant mountain unlike any other seen, covered with trees. Beyond Samarkand, across seven valleys and seven seas. Their life came from that close, insistent sun And in its vivid rays they shone as one. 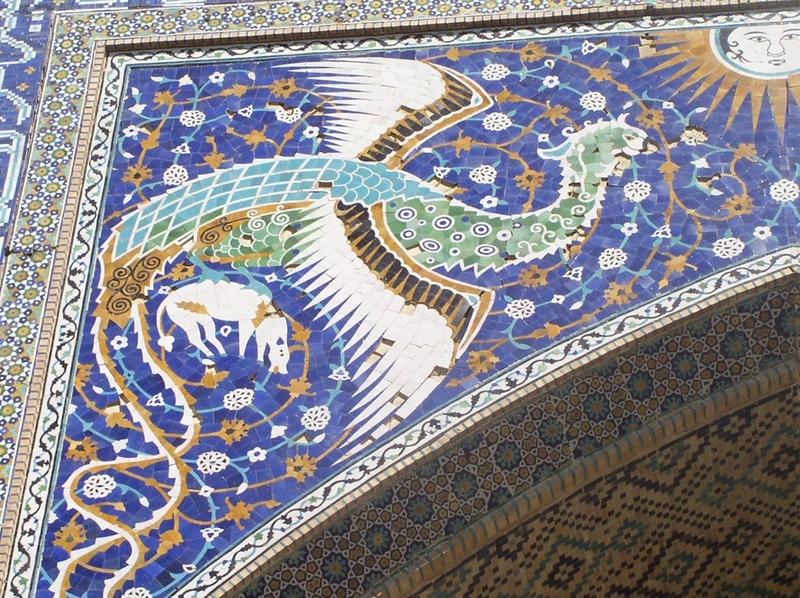 They were the Simorgh and the journey’s end. Neither the pilgrims nor their guide remained. 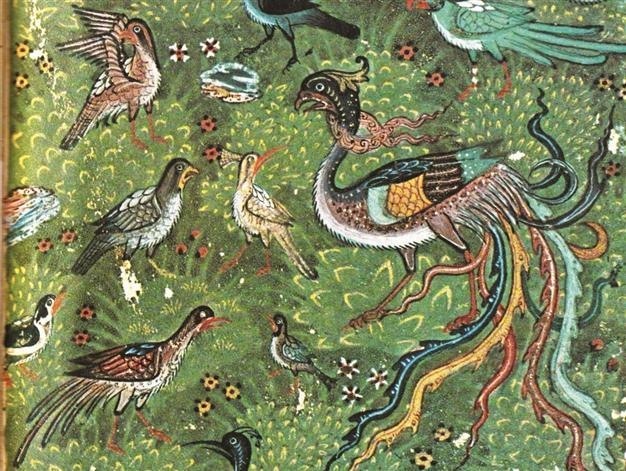 The Simorgh ceased to speak, and silence reigned. There is admirable economy in the birds’ quest, Borges noted—“the searchers are what they seek.” Yet also in this climax is the sense of consumption, mortality, illusion. If you haven’t read it, do it by all means. “The ocean can be yours; why should you stop Beguiled by dreams of evanescent dew? 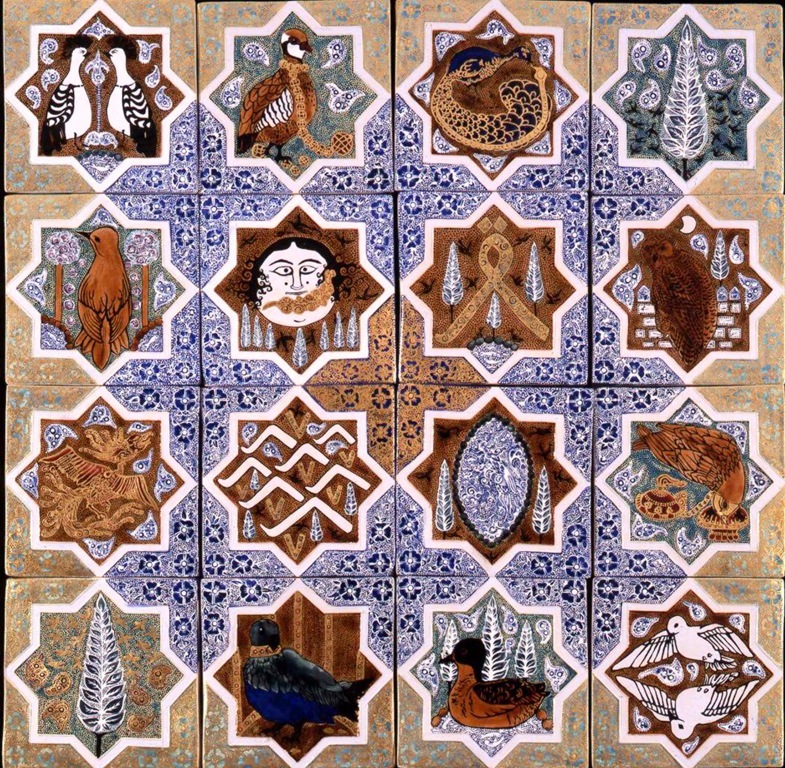 This entry was posted in Baqaa, Ego, Fana, Farid Ud Din Attar, Heart, Imagination, Inner Journey, Inspiration, Khidr, Knowing Self, Knowledge, Literary Criticism, Literature, Mount Qaf, Mysticism, On Reading, Poetry, Realization, Sacred Mountain, Spirituality, Symbology, The Conference of Birds, Transformation, Uncategorized and tagged Birds journey to Mount Qaf, Borges, Farid Ud Din Attar, Literature, Simorgh, Simurgh, The Conference of Birds. Bookmark the permalink. Quote: ““The ocean can be yours; why should you stop Beguiled by dreams of evanescent dew? The quest for wisdom must remain outside any self or system imposed limits. ‘The seekers are what they seek’ Such a simple explanation of a beautiful complex fairy tale. Thank you Don, yes, we seek this, we seek that, there, further, and beyond, few care to seek within. 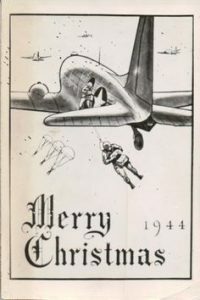 The Angels of the Pacific War, 11th Airborne Division. Birds in their own way. Ah, what a gorgeous post. Sounds a lot like the Quetzal bird of the Aztecs. So what was the best translation? Well, it depends what do you go for, if you care about poetry, lyric prose, or a good narrative? You see, when I lived in Los Angeles used to get together with Persian friends, one of them even took me along to read Rumi in Farsi, with a group of people who would meet weekly, and they sort drilled into me there’s nothing like to read a Persian poet in the original language, of course I do not speak, or read Farsi, anyway their complaints were endless, about translations. I ended buying the Farsi translation of Garcin de Tassy, translated from the French by C,S, Nott. But my advice depending on your taste, before buying it, read the bad reviews of every book, and then if you care, or have the time, read the good ones, but my experience is that in the bad ones you catch what really you may not like. As it is, after buying this book I wrote the post and searching online for the article, I liked some other translations, as well. So be your own judge, or buy several. Ah, since I don’t speak Farsi either, I’ll go for the one with the most beautiful illustrations! (JK!) Thanks, I’ll check the reviews. Hope whatever you get may be the right one for you, Pam. Just by chance before seeing your comment I read your post about the silk road and your train trip, yes, we also hope to reach Simurgh, through the many Oceans, peaks, rivers, and valleys of our life journey. What a wonderful post … in my opinion the second best after the Arabian Night ( Your Best Post ever ) . Thank you, for your kindness, and undeserved praise, I believe the subject itself, makes for a wonderful post, God willing we will explore similar subjects in the future. A most interesting post, as usual, my good friend! In this morning’s contemplation it came to me that all that is in me is also in The One while all that is in the one is not yet recognised by me. If i am ‘good’ or if i am being ‘evil’ all of me is known, and is of, The One. I was also reminded of how we live can be reflected to us so that we may see it better for ourselves. Evil may be seen as a reflection, the reverse or the opposite of what we see that we ‘are’, when we are not yet ‘complete’. It’s complex this matter of evil, and too long to expose it here. it only belongs to the manifested, where duality its the nature of things, but being the manifested, always changing , and ultimately ephemeral, well…it’s does not posses lasting existence. Once you see yourself reflected in that mirror. the darkness is vanished by the Light. Glad you are not overly concerned, about the nature of evil, means you are not suffering it’s effects. Hope you are similarly fortunate! Such beautiful imagery, both literally and in the imagination. The journey to the seven valleys reminds me of the Heart of Great Perfect Wisdom sutra, which involves five aggregates that must be emptied to achieve enlightenment. It seems, along with the seven valleys, we have a lot of stuff to slough off, a lot of work to do, before we can get *anywhere*, huh? Thank you for the post and happy holidays! Yes, indeed, a lifetime task! Different Traditions put it into different ways, but there’s analogy, and similitude. I looked at this book too, some decades ago, attracted by the cover. For some reason I never got completely through it — one of the birds who turned elsewhere. Amazing, just amazing. I liked not only the article, but really enjoyed illustrations. I never knew these stories and never read this book. Great insight and great text. Translation certainly matters. To translate complex texts means to recreate them to some extent. It’s a classic, of Persian poetry. Yes when you read a translation, like the Italians like to say: Traduttore, traditore. I’ll be looking for this book. Thank you for bringing it to my notice. Great, and truthful line Otto, you travel to the confines of Earth to seek Knowledge, and bring us your wonderful experiences, and images. as an arab, i admit i never heard about mountain qaf or Farid, but i enjoyed the story and all its layers. Well, it’s said that comes from Sūrat Qaf (Arabic: سورة ق‎, “The Letter Qāf”) is the 50th sura of the Qur’an with 45 ayat. The sura that opens with the single discrete Arabic letter QĀF. The name of the sura is taken from the letter Qaf at the beginning of the first verse. This sura is associated with Mount Qaf (Kafdag or Cafcuh) in mystical tafsir. According to the traditions of Mount Qaf, it is the name of a mountain from the green emerald surrounding the Earth, and Allah is swearing in the name of this mountain and the Qur’an at the beginning of the sura. Mount Qaf in Arabic tradition is a mysterious mountain renowned as the “farthest point of the earth” owing to its location at the far side of the ocean encircling the earth. Because of its remoteness, the North Pole is sometimes identified with this mountain. It is also the only place in this world where the roc will land. Zakariya al-Qazwini published ʿAjā’ib al-makhlūqāt wa gharā’ib al-mawjūdāt (“The Wonders of Creation”, literally “Marvels of things created and miraculous aspects of things existing”) in the 16th century, a book that was influential in early modern Islamic society. 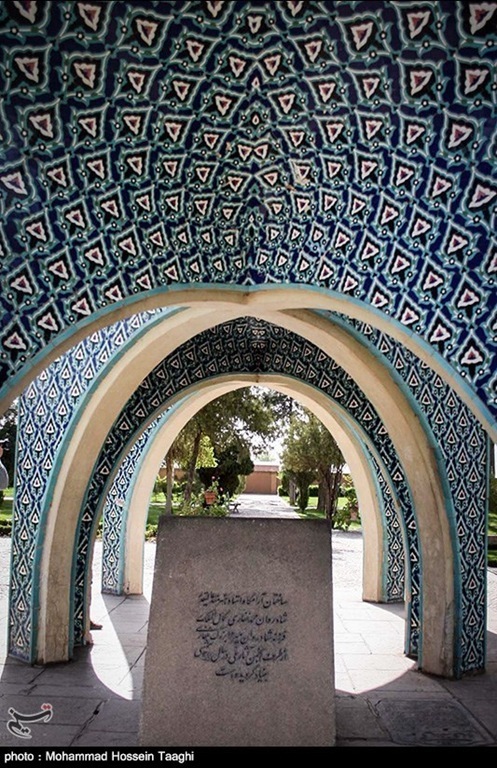 According to Qazwini’s cosmology, the sky is held by Allah so that it does not fall on Earth. The Earth is considered flat and surrounded by a series of mountains —including Mount Qaf— that hold it in its place like pegs; the Earth is supported by an ox that stands on Bahamut, a giant fish (Arabic: بهموت‎ Bahamūt) dwelling in a cosmic ocean; the ocean is inside a bowl that sits on top of an angel or jinn. 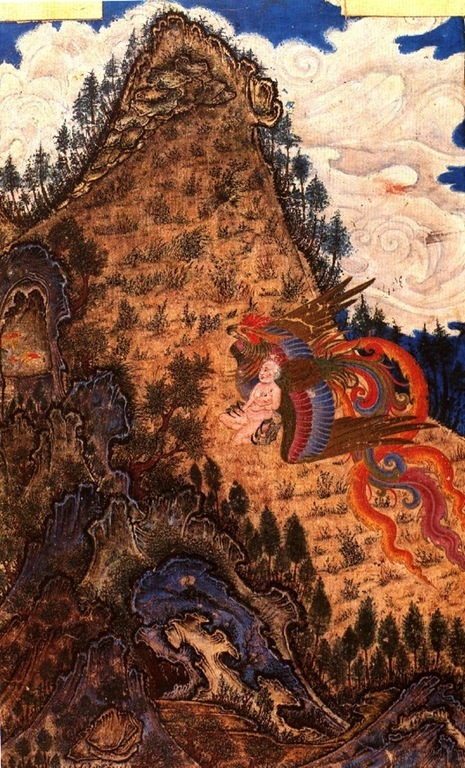 According to certain authors, the Jabal Qaf of Muslim cosmology is a version of Rupes Nigra, a mountain whose ascent —such as Dante’s climbing of the Mountain of Purgatory, represents the pilgrim’s progress through spiritual states. In some traditions —such as in a hadith quoted by Al-Tabari— Mount Qaf is a mountain range that surrounds the farthest edges of the Earth, instead of a single mountain. Well, that’s certainly something i should know. I’ll take a look on the tafassir of surat qaf later.